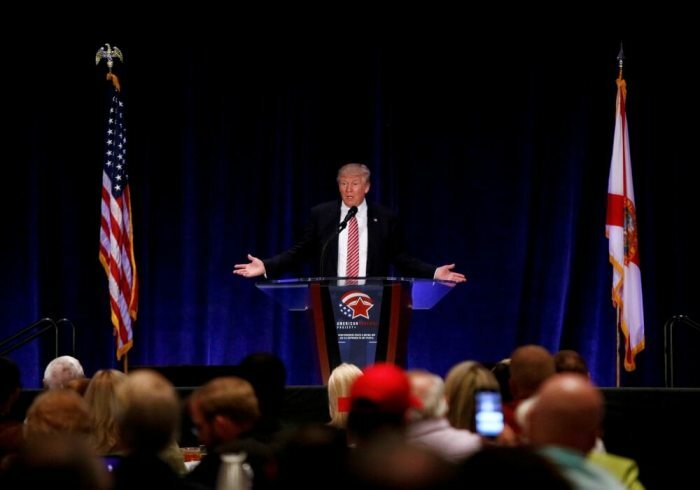 Republican presidential nominee Donald Trump promised a group of pastors Thursday that he will unmuzzle and empower the "silenced" church and increase church attendance by repealing the Johnson Amendment if he is elected president in November. 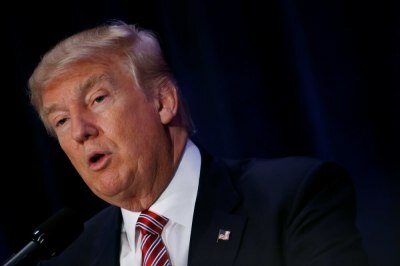 Trump took aim at the legislation while speaking at a two-day event which began Thursday at the Hyatt Regency on International Drive in Orlando, Florida, entitled "Rediscovering God in America Renewal Project." The New York City billionaire explained in his address that he first became aware of the muzzling effect of the Johnson Amendment on the church when he first met with a group of religious leaders several months ago. "There was like silence in the room. Silence. I said 'What is this? What's going on? Why is there silence?'" 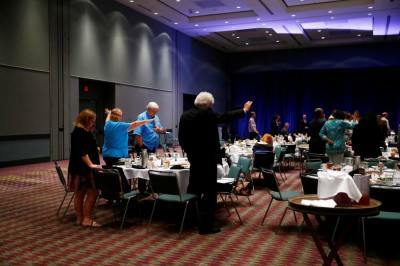 He claimed that the pastors revealed after a lot of prodding that they didn't want to lose their tax-exempt status for supporting him because of the Johnson Amendment. "It was Lyndon Johnson, in the 1970s," he stated incorrectly. "They say he was having a problem with either one or more churches. And they were really going after him and he wanted to silence them …. And for some reason, the churches, the pastors, the evangelicals, they didn't do anything about it," said Trump expressing surprise because "I know how tough you are." "And if you look what's happened to religion, if you look at what's happening to Christianity. If you look at the number of people going to churches, evangelicals know this also, it's not on this kind of a climb," said Trump motioning upwards with his hand. "It's on this kind of a climb," he said making a downward movement. "Slow and steady in the wrong direction and a lot of it has to do with the fact that you've been silenced. Like a child has been silenced, you've been silenced. Strong, brilliant, great people that want to do the right thing. We're not talking about bad people we're talking about great people. They say, 'don't do that Donald. Don't do that Donald, ok? Great people," he said with a wry grin intimating how he has benefitted from the guidance of evangelicals. "And I said, 'you know' I said 'I'm gonna take this into my own hands because I am good at this' … and I started telling people about it because it really had an impact on me. That people are silenced that are really our finest people. And their power has been taken away. Your power has been totally taken away," said Trump pointing to the audience. "I don't want to insult anybody," he said quickly pulling back his hands showing both palms. "But your power has been totally taken away." "This would be so great for religion, but it would be so great for the evangelicals, for the pastors, for the ministers for the priests, for America," he said pointing toward the audience again. He continued: "They took away the voice of great people, they took away the voice of people that want to see good things happen. It's not like they took away a bad voice, an evil voice, they took away a voice. And I mean took it away … but if you were in that room with me they were silent. They didn't want to get involved." "We'll get it out. We'll be able to terminate the Johnson amendment. And you'll have great power to do good things and religion will start going instead of this way (downward motion). Christianity, when you think of what's happening, when you look at the numbers. I talk about Sunday School, people don't even know what I'm talking about anymore. When you look instead of going this way (downward motion). You're gonna go this way," he said moving his hand upward. "We're gonna bring it back because it's a good thing," Trump promised. "They treated you like it was a bad thing but it's a great thing, not a good thing. It's a great thing."